The 4th AFNF workshop sessions highlighted innovative research, program challenges, agriculture, food safety, climate change and gender issues. In the current forum, IUFoST was represented at the Forum by Dr Obadina Adewale Olesugun, Senior Lecturer, Department of Food Science and Technology, Federal University of Agriculture, Nigeria, and Dr George Ooko Abong', Lecturer at the Department of Food Science, Nutrition and Technology, University of Nairobi and Chairman of Food Science and Technology Platform of Kenya (IUFoST) affiliates. The two IUFoST representatives are former IUFoST Young Scientist winners. The report gives an account and highlights of what took place at the forum. After opening remarks, the session on scaling-up of nutrition-linking scientific evidence to implementation to tackle programmatic challenges with a keynote presentation from Dr Lemma. Other presentations included nutrition education and effects on haemoglobin, stability of vitamins under storage in light, and the need for adequate intake of complementary foods. The Food and Nutrition session looked at the SDGs in relation to childhood malnutrition. The last session on gender-focused multi-sectoral and integrated nutrition strategies included insights on utilisation of maternal services by adolescent girls in Senegal, Ethiopia and Kenya, and community based behavioural communication strategies for improved awareness and demand for iron-folic acid among pregnant women in Kenya. Important outcomes were discussed. The morning session began with a keynote presentation from Dr Obadina Adewale, IUFoST representative on the status of food safety in West Africa. He also made a joint presentation with Dr George Abong’ on reducing aflatoxin exposure in sub-Saharan Africa by postharvest sorting of peanuts, featuring insights into IUFoST's involvement with its Adhering Bodies in a proposal to build a pilot plant in a university in Nigeria. Other presentations focused on phytochemical reductions under room storage in water melons from Kenya, final levels and effectiveness depending on the variety. The final presentation focused on dietary diversity and nutrition status in Southern Ethiopia. The afternoon session opened with a keynote speech from Dr Zewdu Eshetu on climate change and its effect on food and nutrition security. A discussion panel delved into various aspects including the role of government in assuring nutrition in Ethiopia, and the cost of hunger and maternal and child nutrition aspects, especially in West Africa. Participants were invited and enjoyed the warm welcome and traditional delicacies of Ethiopia including the local songs and dance. This last session focused on the scientific innovation for sustainable food production, improved nutrition and health. Dr Christele Humblot began the session with a keynote address followed by a presentation on a study on efficiency of protein in supplementary foods locally produced in DRC. Dr Abong’ made a presentation on the food science and technology network in Africa and its relevance in harnessing professional involvement for sustainable food systems. His presentation looked at the present network and internal challenges and concluded by encouraging African professionals to embrace similar networks. 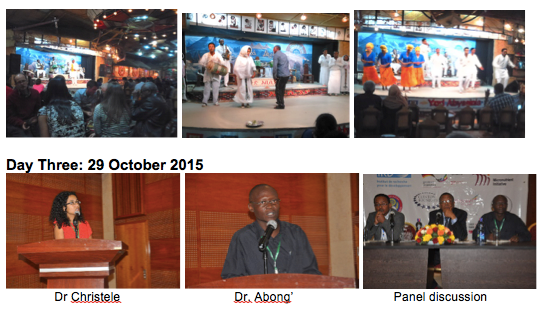 · Efforts to be made to make the forum more inclusive to reflect the face of Africa. · The Forum to recruit more members − representatives for five African regional blocks were appointed to spearhead this.